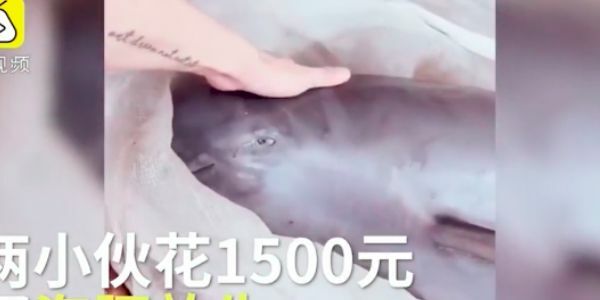 It was a horrific sight: a live porpoise cried as its captors auctioned it off for parts. Literally the animal had tears rolling down its face and it was making crying sounds. Luckily, two animal activists were able to purchase it and release it into the wild, but the trauma is done and whoever did this is still out there. Sign on if you want Chinese authorities to investigate this act of animal cruelty and punish the responsible parties. Poiposes are a lot like dolphins actually. And the porpoise in question is not only adorable, but it's also endangered. The finless porpoise is on the red list. It's believed there are only about 200 of them left and this one was almost murdered for parts! The sweet porpoise cried the whole time it was being auctioned off and it's likely that it was injured because, when the activists took it out to sea, it had a difficult time swimming. It's completely outrageous that someone captured this rare and endangered creature just to torture and ultimately murder it. Catching and selling a finless porpoise is completely banned and illegal in China. That's why we want to make sure the authorities find whoever did this and bring them to justice!